The United Nations (UN) has called on the Israeli regime to immediately stop the destruction of Palestinian houses in the occupied West Bank. “In the past three days, 77 Palestinians, over half of them children, have been made homeless,” James W. Rawley, the United Nations Resident and Humanitarian Coordinator for the occupied Palestinian territory, said on Friday. The UN official also expressed concern over the spate of demolitions of Palestinian homes by Israeli authorities in the occupied territory, including East Jerusalem al-Quds. “Some of the demolished structures were provided by the international community to support vulnerable families. Demolitions that result in forced evictions and displacement run counter to Israel’s obligations under international law and create unnecessary suffering and tension,” Rawley stressed. “They must stop immediately,” he emphazied. 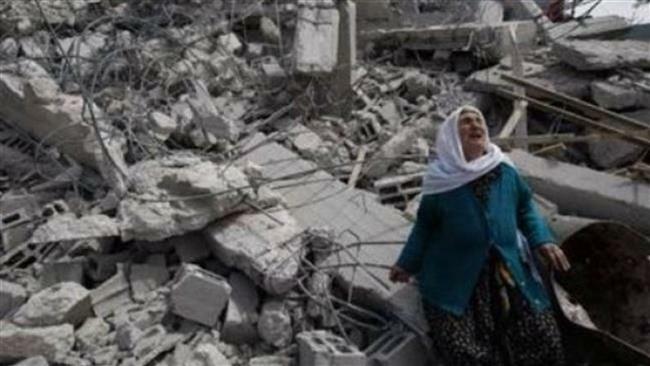 According to the UN Office for the Coordination of Humanitarian Affairs (OCHA), Israeli authorities have razed to the ground as many as 42 Palestinian-owned structures in Ramallah, Jerusalem al-Quds, Jericho, and al-Khalil (Hebron) since January 20. This is while according to international law, the destruction of private or public property in occupied territories is prohibited. 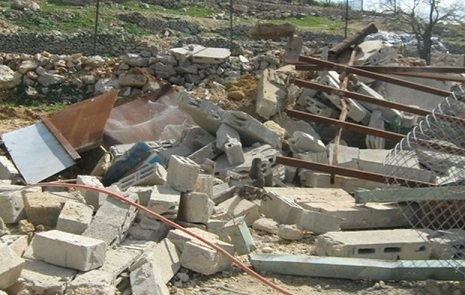 The Israeli regime destroyed at least 359 Palestinian structures in the West Bank throughout 2014, according to the Israeli Committee Against House Demolitions, which is a non-governmental group. The United Nations Resident and Humanitarian Coordinator James W. Rawley confirmed on Friday that, in the past three days alone, a total of 77 Palestinians, over half of them children, have become homeless. He expressed concern over Israel's recent spate of demolitions of Palestinian homes in the occupied West Bank, including East Jerusalem. Home demolitions must stop immediately, Rawley demanded, in a press release that WAFA received. Since 20 January, the UN Office for the Coordination of Humanitarian Affairs (OCHA) has recorded the Israeli demolition of 42 Palestinian-owned structures in the Ramallah, Jerusalem, Jericho and Hebron governorates. In addition to those displaced, 59 Palestinians were affected, mainly due to the demolition of structures essential for their livelihood, mostly animal shelters. Area C of the West Bank is under complete Israeli control. Humanitarian and Legal bodies and institutions such as the UN, OCHA and B’Tselem confirm that the planning policies applied by Israel in Area C and East Jerusalem discriminate against Palestinians, making it extremely difficult for them to obtain building permits. Having no other choice, many Palestinians are forced to build without permits to be able to provide a shelter for themselves and their families, risking having their buildings demolished, in the process. Rawley demanded that Palestinians must have the opportunity to participate in a fair and equitable planning system that ensures their needs are met. The Israeli Occupation Forces (IOF) razed Friday a symbolic village, named after the Minister Ziad Abu Ein, which was set up by anti-settlement activists near the “Gush Etzion” settlements bloc near Bethlehem. IOF soldiers accompanied by a number of settlers surrounded the Palestinian peace activists after they managed to plant dozens of olive trees in the area in honor of the martyr Abu Ein who was killed at the hands of Israeli forces. The IOF soldiers declared the area a closed military zone and tried to attack the activists. The coordinator of the popular committee against wall and settlement in Bethlehem Hassan Brijeah and coordinator of the popular committee in Beit Ummar, al-Khalil, Yousef Abu Maria were both arrested during the attack. Late December, Israeli forces forcefully removed Abu Ein village 1 that was also established in honor of the minister Ziad Abu Ein who was hit and killed by Israeli soldiers during an anti-settlement event. Abu Ein village 2 was re-established on Friday to mark the 40th day after the minister’s murder. Israeli forces detained a Palestinian child near the village of Maghayir al-Abeed and demolished four structures in the Palestinian village of Ar-Rifa'iyya in the South Hebron Hills area on Wednesday. 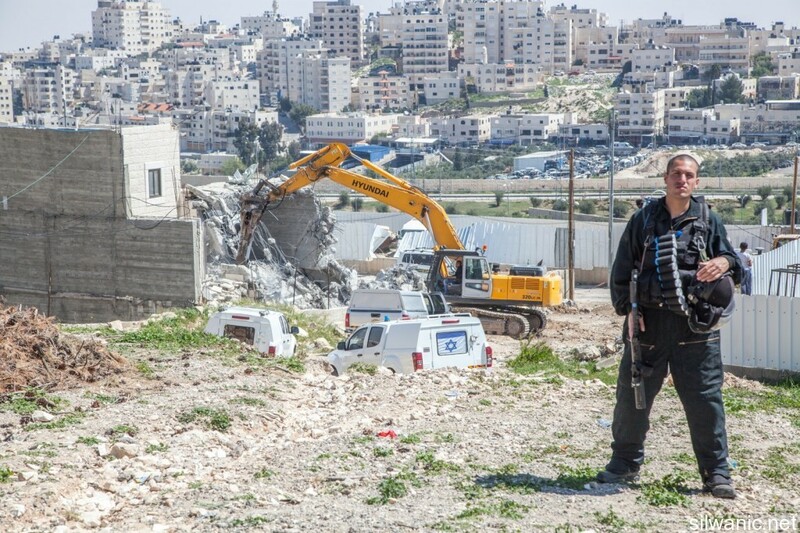 An Operation Dove press release said that bulldozers tore down two houses and two animal shelters belonging to the Rabai family of Ar-Rifa'iyya. The demolitions affected a total of 25 people, including 10 children. The families required municipality aid to keep them in a safe place, after being left homeless. The municipality offered two tents for the affected families to stay, at least, during the night. Just 20 days ago, in the village of Ad-Deirat, near Ar-Rifa'iyya, two settlers broke a window and threw a molotov cocktail inside a Palestinian-owned house, trying to burn it, said Operation Dove. Ar-Rifa'iyya and Ad-Deirat villages are located in Area C, under Israeli military and administrative control, WAFA correspondence further reports. While Ar-Rifa'iyya demolitions were being carried out, Israeli army and police jeeps reached the area of Old Havat Ma'on Hill near the Palestinian village of Maghayir al-Abeed, where some young Palestinian shepherds were grazing their flocks. An Israeli soldier ran after a Palestinian child, aged 14. The soldier chased away the boy’s flock, put the child inside the military jeep with one goat and detained him. After an hour, the army released the boy in an extremely dangerous place, between the illegal Israeli outpost of Havat Ma'on and the illegal settlement of Ma'on. In this place several times Palestinians, including children, were attacked by extremist Israeli settlers. The Palestinian Prisoners Center for Studies stated that, during 2014, Israeli soldiers arrested 1,200 Palestinian children, showing a 60% increase comparing to 2013, when the soldiers arrested 750 children. In related West Bank news, WAFA further reports that 14-year-old Malak al-Khatib, from the village of Beitin, was taken from Ofer military court to begin serving her two months sentence in prison, for alleged rock throwing and possession of a knife. After being detained for 23 days, Malak was sentenced to two months in prison and a fine of 6000 shekels ($1523), even though she had hopes of being released to reunite with her family who has been living in distress ever since Malak was detained on December 31, 2014. “She was leaving school after attending her last exam for the first semester when all of a sudden soldiers jumped at her, handcuffed her hands and took her with them,” he said. A military decision was supposed to be made on January 4th, however the court postponed her hearing to January 11. Malak’s detention was extended several times, and she spent around 23 days awaiting her ruling. At the time, the lawyer defending her was trying to reduce the fine. She is now serving her sentence in Hasharon detention center with three other female prisoners who are, according to her father, taking care of Malak and supporting her emotionally. Malak is considered the youngest prisoner currently serving a sentence in Israeli jails. She is one of 7000 Palestinian children who were arrested since the start of the second Intifada in September 2000, many of whom are still serving sentences. Lawyer Ayed Abu Qutesh told WAFA that, even though the International law allows the detention of minors, it should be always the last decision that any court or state takes. All concerned parties should try to find other alternatives to the detention and actual imprisonment of children, such as fines and suspended imprisonment. Malak’s family wasn’t able to visit her at the detention center, but only saw her at the court on January 11 for the first time after her arrest. Her father said then that she looked distressed and scared. “After all she is only 14,” he explained desperately. 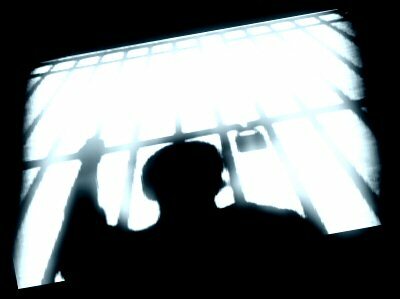 WAFA tried to reach Malak’s father once again to learn more about the condition of Malak now that she is serving the sentence, but he remains out of reach. Meanwhile, the Ministry of Education condemned in a press release the ruling, describing it as a “heinous crime”. While Palestinian children endure such conduct, no Israeli children come into contact with the military court system, proving the amount of discrimination in the Israeli system. A UNICEF report concluded that ill treatment of Palestinian children in the Israeli military detention system appears to be 'widespread, systematic and institutionalized'. “On average 700 Palestinian children a year, appear before Israel's military court,” the United Nations has said. About 726,000 Palestinian men, women and children have been through the court since the occupation of the Palestinian Territories, in 1967. According to the report, children detainees are treated harshly in most cases. It mentioned measures such as binding hands and eyes, signing documents in Hebrew, physical and verbal abuse, night arrests, threats, strip searches and solitary confinement to name a few. Local and international media outlets reported on Israel’s cabinet’s decision to back a law change allowing harsher sentences of up to 20 years for stone throwers after the recent tensions in Jerusalem’s Old City. Meanwhile, on Thusday, an Israeli court released two security guards stationed at the illegal settlement of Itamar, southeast of Nablus, a day after their arrest under the pretext of firing at two Palestinians earlier January. According to Israeli army radio, the court decided to release two security guards, arguing that they 'aimed at the open air and didn’t intend to shoot the two Palestinians'. The security guards, accompanied by the army earlier in January, attempted to arrest four Palestinians and, during the arrest, the guards opened fire on two, injuring them. The two sustained moderate injuries and the two then-suspects were referred to the Magistrate's Court in Petah Tikva, East of Yaffa to extend their detention, pending an ongoing investigation. Also on Thursday, Israeli forces demolished Palestinian residential structures and sheds in Beit Iksa village, to the northwest of Jerusalem. 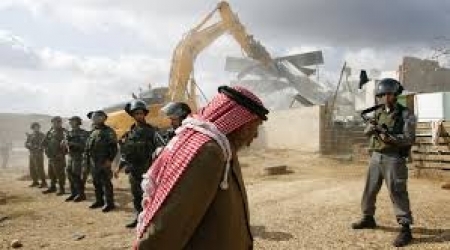 Head of Beit Iksa Village Council Sa‘ada Khatib said that Israeli troops, accompanied by military bulldozers proceeded to demolish residential structures and sheds belonging to the Ad-Dahawiq Bedouin tribe. Khatib added that forces routinely target the village, placing it under siege and cordoning it off. He urged competent authorities to intervene in order to support the villagers, given the lack of public services and intermittent transportation. According to the Beit Iksa Village Profile, prepared by the Applied Research Institute of Jerusalem (ARIJ), the village consists of an area amounting to approximately 7,989 dunams. Approximately 591 dunums, accounting for only 7.4%, are assigned as Area B, whereas about 2,849, accounting for 92.6% are assigned as Area C.
Israel retains full control over Area C, where the Palestinian villagers are prohibited from building and land management unless they obtain permits from the so-called Israeli Civil Administration. Most of the land making up Area C is agricultural and open spaces, to which access is very difficult for local villagers. Israeli occupation authorities have seized about 2,000 dunums for the construction and expansion of illegal Israeli settlements and the construction of the apartheid wall. According to data issued by ARIJ in 2012, a total of 1,545 have been seized for the establishment of the illegal ‘Har Samuel 2’ and ‘Ramot 3’ (Also known as ‘Ramot Alon’) settlements. These illegal settlements form a part of the ‘Giv’at Ze’ev’ settlement bloc which Israeli occupation authorities have constructed in order to retain control on the northwest of Jerusalem. This step is inextricably related to Israel’s plan to annex all settlements in the West Bank. Other large tracts of land have been seized from the village to construct bypass roads 436 and 4915 to connect Israeli settlements established on the village’s lands with other Israeli settlements. In addition, Israeli forces have seized lands extending 75m along each side of the road as a buffer zone. Israel has constructed part of the wall on lands belonging to the villagers. The wall route extends 9 km over the village land and isolates 7,840 dunums, accounting for 98.1% of the total area, from the southeastern and southwestern sides of the village. The isolated lands include open space and agricultural lands which constitute a major source of capital for the village’s residents. The village remains isolated from neighboring Palestinian villages to the northwest of Jerusalem City. The residents are not allowed to travel to Jerusalem City, and the only exit is through an Israeli checkpoint established on the north-western entrance. The army said the Palestinians cannot live in this area, and cannot even use for grazing purposes or agriculture. Member of the Union of Agricultural Work Committee, Fayez Abu ‘Alia, said Israel's violation is part of ongoing policies that aim at making it difficult for the villagers and farmers to earn their daily living, in an attempt to push them to leave. Several members of the Agricultural Work Committee visited the area, while their lawyer Ashraf an-Nashasheeby met with farmers and shepherds, and stressed on the importance of immediately informing the committee of all violations as they happen so that it can file all needed legal work in a fast and a professional manner. The Committee has been working in Area C of the occupied West Bank, under full Israeli military and civil control, planted trees along with the villagers, in addition to providing them with seeds to plant, and paving a road that enables them to reach their lands. 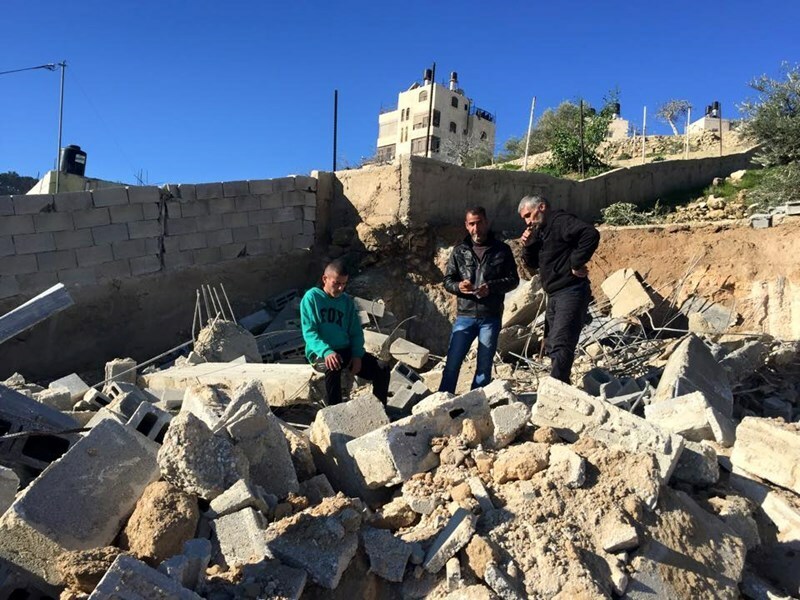 The Israeli-run municipal crews Wednesday knocked down a Palestinian civilian home and a two-story residential apartment sheltering four families in Occupied Jerusalem on account of unlicensed construction. Members of the Israeli municipal staff, escorted by armed bulldozers and officers, turned the 60-square-meter-large family home of the Palestinian civilian Alyan Rabay’a into mounds of rubble shortly after they stormed al-Farouk neighborhood, in Jerusalem’s Jabal al-Mukabir, the house owner said. The demolition procedure was carried out under allegations of unauthorized construction, Alyan further reported, adding that he has been planning to take shelter in the building with his wife-to-be in the near future. “I’ve been grappling with over 100-shekel-household debts. Now the Israeli occupation razed my prospective family home to the ground despite my incessant appeals for a building permit,” he said. 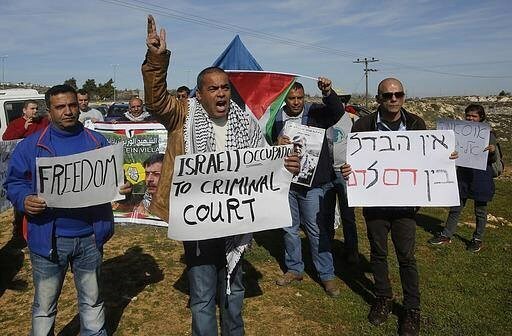 Dozens of Palestinian natives of Jabal al-Mukabir have rallied in front of the Israeli Supreme Court in protest at arbitrary Israeli demolition policies at a time when a hearing, set to be held to that end, was to kick out. The Israeli municipal staff further razed a two-story residence in Jerusalem’s village of Shu’fat under the same allegations. Head of the sit-inners’ committee, Youssef Mukheimer, said the leveled apartment is a home to four Palestinian families and covers an overall area of some 500 square meters. The apartment building has been there for two years, he further stated, adding that its proprietors were forced to shell out an estimated 200,000 U.S. dollars to rescind the demolition issue, but to no avail. Israeli forces, on Tuesday, handed out notices regarding the approved demolition of 30 Palestinian-owned structures in al-Dir, a locale to the east of Ein al-Bayda, in the Jordan Valley. An official within the popular resistance community, Khaled Mansour, said that an Israeli special unit, backed by a large military force, raided the locale and handed residents demolition notices for 30 structures, including residential sheds, animal barns, and fodder storage units. The notices gave the residents until February 16 to appeal the decision, according to WAFA correspondence. Residents of the locale depend on farming and grazing livestock for a living; some of the homes there were built before the Israeli occupation in 1967. However, attempts by the Israeli occupation to take over the area has not ceased since then. The Palestinian population, there, is subject to extremely hard living conditions; their homes are constantly demolished, in addition to the imposition of restrictions on movement and denial of access to fields in order to graze their livestock. Mansour called upon all relevant sides to support these residents and stand by their side, in the face of the Israeli systematic ethnic cleansing and displacement attempts. Earlier on Tuesday, Israeli army forces delivered four evacuation notices in Khirbet al-Dair, north of the Jordan Valley in order to demolish a number of homes which were allegedly built without obtaining the necessary legal permits. Meanwhile, Israeli forces have demolished a well owned by Palestinians and used to collect rain water in the town of Halhoul, to the north of Hebron. The Jordan Valley is part of Area C of the West Bank, under complete Israeli control, where Israel rarely issues construction permits for Palestinians, prompting them to embark upon construction without a permit. Several Israeli military and police vehicles, accompanied by a number of bulldozers, invaded Jabal al-Mokabber town, south of occupied East Jerusalem, and demolished a Palestinian home after surrounding it. The Wadi Hilweh Information Center in Silwan (Silwanic) has reported that the soldiers surrounded the home of resident ‘Oleyyan Rabay’a, in the as-Sal’a neighborhood, before storming it. The soldiers then demolished the home, under the pretext of “being built without a construction permit,” despite the family’s constant efforts to obtain all legal documents, and the heavy fines imposed on them. Silwanic said the soldiers have repeatedly invaded the home, and ransacked its furniture, over the last few months. The home is comprised of three bedrooms, several bathrooms and a kitchen; the family was in the process of fully furnishing their property, but were constantly interrupted by ongoing invasions by the army and the City Council. The family received the official demolition order only two days ago, on January 19, and were still initiating legal measures to challenge it. They said Rabay’a was planning to live in his home after his upcoming wedding. Israel also wants to demolish two more homes, belonging to the family of Jalal Raba’ya, while the City Council will be holding a session on Friday to make a final decision. The Jabal al-Mokabber Land Defense Committee, local figures and several popular groups, called for a protest in front of the Israeli Supreme Court, denouncing Israel’s illegal policies of home demolitions in an attempt to push the Palestinians to leave. Head of the Committee, Suleiman Abu Shqeirat, said Israel issued 150 demolition orders against the Palestinians in Jabal al-Mokabber alone, adding that the City Council’s over exaggerated measures, and high fees, are making it impossible for the Palestinians to obtain construction permits. In addition, soldiers invaded Silwan town, south of the Al-Aqsa Mosque in occupied Jerusalem, and kidnapped three Palestinians identified as Ziad al-Qaaq, Mousa Odeh and Naji Odeh. On Tuesday, soldiers demolished a Palestinian home in the town of al-‘Eesawiyya, in occupied East Jerusalem, and also demolished several homes and structures in the southern West Bank district of Hebron.